Hello and happy Monday Tuesday. I am dragging this week stressed with a lot going on at work, half-marathon training and adjusting to a new exercise schedule and my posts have been few and my eats not super exciting, I’ve been a bad food blogger! A lot of my stress has been training for a half-marathon in just over 2 weeks, my training has been going slowly while trying not to injure my ankle again. As much as I enjoy running, I’m also looking forward to getting this over with so I can just run more on my own pace and not stress about training. I know races are supposed to encourage fitness goals and rejuvenate our drive to maintain fitness, but typical woman here has put too much stress on herself to train and prepare. I have discovered that intervals are working much better for me and not affecting my time anywhere near as much as I thought they would. Initially I wanted to run the entire half, but I tweaked my ankle over training striving for that goal and tried Jeff Galloway’s 7 min/30 sec intervals when I picked up training again. On my long run Saturday, the walk intervals got more frequent towards the end, but allowed me to go a couple more miles while staying in my time goal and giving me the ability to walk the next day, my legs weren’t nearly as tired as I thought they would be. I’ll be running the half with my two sisters who are different runners, one swears by intervals and the other maintains a steady pace. Guess I’m an interval gal for now. Anyway, some of my less boring eats from the last few days. 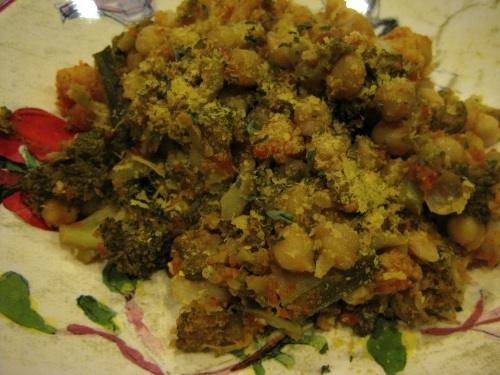 Chickpeas sauteed with broccoli, zucchini and marinara sauce and topped with parm nut topping. I really never get tired of marinara sauce and have been enjoying a lot of cooked vegan bean dishes lately. I had to soak the dried chickpeas overnight in the fridge, then boil them for 10 minutes to get them soft, I’m still adjusting to working with dried chickpeas. It was worth the effort and made great leftovers. 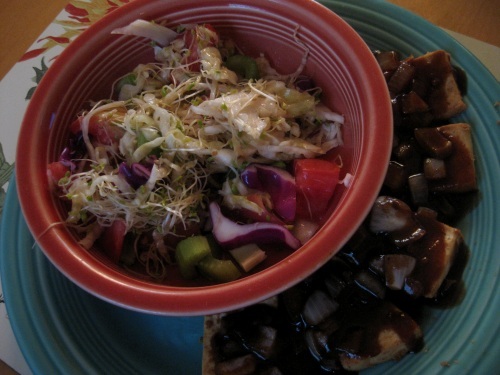 This tofu Barb-a-fu recipe with a raw side salad. I didn’t have cornmeal or flour, so I used Trader Joe’s peanut flour and it turned out fine. The flour could hardly be tasted, but didn’t seem to have a negative impact on the recipe. It was simple, fun and filling. A little messy. Orange-carrot-lentil soup, or mush :-), with a kale side salad. 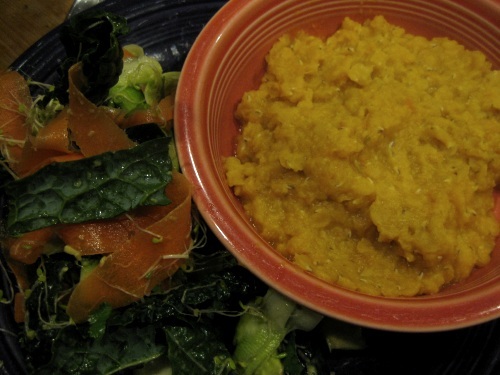 I’m really digging fresh orange flavor with red lentils and have been trying to perfect a recipe using it. This one used an orange, carrot, fennel seed sauce I created in a blender. 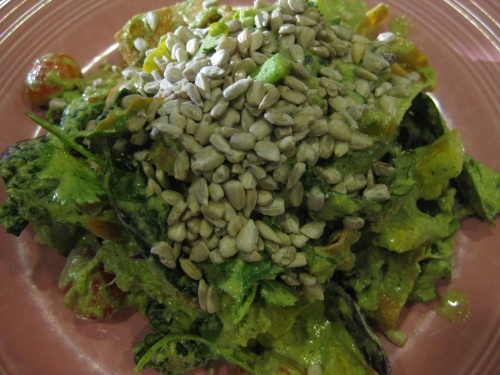 A monster salad with cilantro hemp seed pesto dressing and topped with sunflower seeds. Yum! 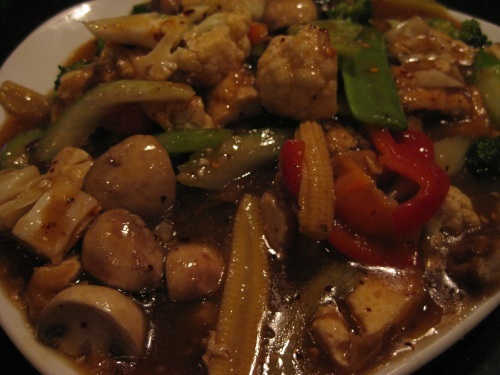 A Thai tofu dish I got Friday night loaded with veggies at one of our favorite Thai restaurants where they have a vegan veggie, tofu version of just about every dish. 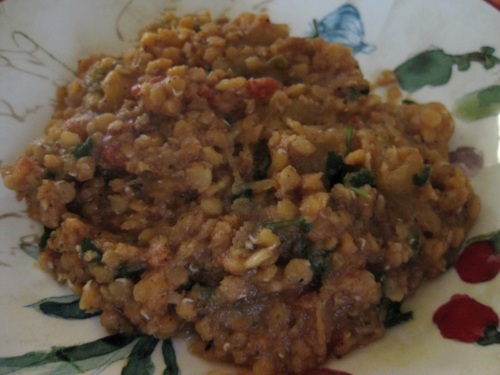 What can I say, dried lentils are easy and fast to cook after a busy, brain-gooifying day! Red lentils sauteed with Trader Joe’s salsa, steamed spaghetti squash, cilantro and cayenne pepper seasoning for an awesome Mexican themed vegan dish. For a last minute throw together, it was a success and a recipe that I will be trying again soon. 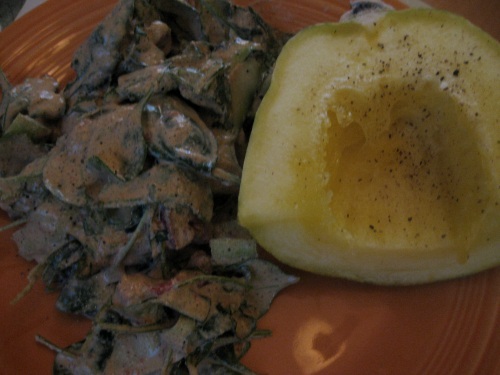 More spaghetti squash with a side salad dressed with Kristen Suzanne’s Nacho Hemp Sauce. One of those dinners that sounded easy in theory in my head, but ended up being more time-consuming and messier than I thought. Anyway, I like the term “naked” to describe a raw foods diet, it sounds less harsh. Naked is a term I use instead of raw, because raw can be scary and limiting. Say the word vegan and watch people cringe. Talk “naked” and eyes widen with curiosity. I created “naked nourishment”–delicious foods that have none of the ingredients that can cause you bodily harm. I never buy mini corn either and only have it while eating out, I’ve only seen it in cans at stores and skip buying cans in general. Naked is a great term! I’m the same with races- I’ve stopped signing up for them because I put too pressure on myself and get really stressed out instead of enjoying the training process. I always feel the same way by the end of my training for a longer race– just ready to be DONE with it and run when I want, how I want! Your orange carrot lentil soup sounds divine, Christine!